1. Heat oil in a deep frying pan over medium flame. 2. Mix the 1/2 tblsp garlic powder, turmeric powder and nutmeg powder in a bowl. 3. Rub this all over the chicken pieces and keep aside to marinate for 10 minutes. 4. Add the chicken pieces to the hot oil and deep fry for about 5 minutes on each side. 6. Transfer them to a serving plate. 7. Melt butter in a small pan. 8. Add the remaining garlic powder and salt. Mix well. 9. Pour this over the fried chicken just before serving. 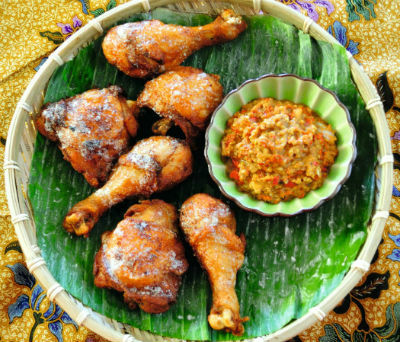 Feel free to comment or share your thoughts on this Butter Fried Chicken Recipe from Awesome Cuisine.